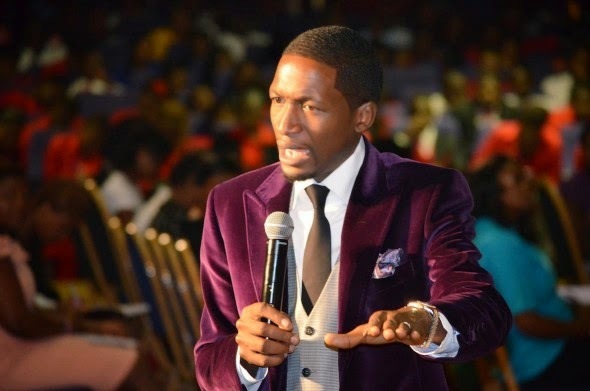 A website called The Telescope News based in Accra Ghana claims that the sun is setting for ‘fake’ Zimbabwean prophets, Uebert Mudzanire aka Angel, and his partner in deceit Emannuel Makandiwa, as it has now come to light that both are facing possible arrest, following an underground strategy by Ghanaian and Zimbabwean clergyman, to put an end to their alleged illicit spiritual trickery, which is costing the salvation of many souls. We first reported in February 2014, that a group of Ghana pastors, mainly from Sekondi-Takoradi twin cities, had fallen out with Makandiwa and Angel’s spiritual father called, Victor Kusi Boateng also from Ghana, and had decided to meet President Robert Mugabe, to expose the duo who are accused of using dangerous voodoo and occult powers to lure and entrap gullible worshipers. The strong muti or ngorongoro voodoo is also believed to be the source of their unexplainable wealth, which has seen Angel winning contracts in America, with Makandiwa who does not have known business qualifications or skills, boasting of owning stocks on the London Stock Exchange (LSE). It emerged last week, that the head of the Ghanaian delegation, Lawrence Ajoba, was warned not to prematurely visit the country together with his fellow pastors until tensions eased, as it was “unsafe” due to the “anger and wrath they could meet upon arrival in Zimbabwe”, as some loyalists and followers of the two dubious prophets had vowed to beat them up, if they set foot in Harare. Ajoba in an exclusive interview with our media contact in Ghana, said they have provided evidence to the President’s Office, that both Angel and Makandiwa should be arrested and have their churches closed, if First Lady, Grace Mugabe is to pass away, because this was the only spiritual evidence that would carry weight as it involves the president’s wife. Ajoba said God did not show the sad death prophesy of “Amai Mugabe”, to Angel and Makandiwa because they are fake, and are in fact “fetish priests” just like Nana Kwaku Bonsam, the godfather of their spiritual and occultic father, Kusi Boateng. Angel has previously been linked to “financial sponsorships” from a Harare business mogul, who is also accused of initiating the so called preacher into the occult. When the story was broken, a visibly shaken Angel flew to Britain from Zimbabwe at the speed of light, to defend himself on another Zimbabwean website, which published the story. “I feel sorry for Prophet Uebert Angel and Prophet Emmanuel Makandiwa, for they are now in hot soup,” said Ajoba. Ajoba went on to claim that Angel has impregnated a young woman, whom he decided to hide in Germany a few years ago, while he was based in Zimbabwe. The Ghanaian pastor said there is nothing “new under the sun” and all hidden things cannot be hidden forever, the Lord eventually brings everything into the open. The e-mail written to the said pastor in question, by one Shorai Karimanzira also forwarded to us, reads in part: “Hello Prophet Quarm. I have heard good things about you sir and was hoping if you would help me to look into my future sir. Thank you.” A telephone number has also been provided. Zimbabweans in Germany are said to be irate about Angel’s alleged impregnation, after posting the lady into a foreign land where she did not know the language, nor had family living there, just to protect himself. In his closing remarks, Ajoba also said Kwaku Bonsam’s days are numbered because he recently attempted a spiritual attack on him, but failed. Kwaku Bonsam declares himself, to be: “The most powerful spiritualist of Africa. The Great Authentic man , Nana Kwaku Bonsam is believed to be the reincarnate of Okomfo Anokye,” his tweeter profile message says. The fetish priest has reportedly provided black magic, to over 1700 pastors in Africa, to grow up and prosper their churches including Zimbabwe. Angel and Makandiwa, have never openly denied receiving such from Bonsam, through Kusi Boateng as accused by their detractors. Makandiwa had no shame last week in speaking about his controversial wealth, while addressing a so called “Billionaires Mindset Summit” in Harare. The businessman said his income comes from business and not the church, going to length in his blasphemy, talking about investment opportunities in spite of the economic situation in the country, instead of praying for the sick and preaching the gospel. “It is believed that preachers everywhere make money through taking advantage of the poor. If the people are poor then what can a preacher take from them as the congregants actually have nothing in the first place? Besides preaching the gospel, I am involved in a number of private projects that have enabled me to acquire a lot of wealth. It amazes me that people think I live off the contributions of my church when in actual fact that money may contribute to the buying of my bread and eggs only. I have been blessed in my own capacity to the extent of being ‘listed’ on the London Stock Exchange not as UFIC but as Emmanuel Makandiwa,” he bragged.